Simply mentioning the word Jade conjures up images of Chinese imperial palaces and objects of great beauty and immeasurable value. Indeed, Jade has played an immensely important role in culture from ancient times, both in China and beyond. Read on to learn about this sacred and protective Stone of Heaven that witnessed the birth of civilization, and adorned the palaces of emperors. Occurrence: China, Taiwan, New Zealand, Canada, India, USA, Russia, Germany. By far the most celebrated stories of jade belong to China, where it has been prized and revered for more than six thousand years. Wars have been fought over it, and whole cities have been traded for it. However jade nephrite has also played a significant role in other cultures, including the New Zealand Maoris and ancient Neolithic cultures. There are in fact two distinctive minerals that are described as jade, one is nephrite jade and the other, jadeite (a sodium aluminium silicate). Though jadeite is the more rare of the two and is generally more highly valued, Nephrite Jade is the true and original jade of ancient China (Jadeite was first imported into China as recently as the 18th Century). Another mineral, which is referred to as “Transvaal Jade”, is in fact a form of grosular garnet. The name nephrite is derived from the Latin word, nephros, which means kidney, and the word jade has its origins in the Spanish term, piedra de ijada, or “loin stone”. These names allude to nephrite jade’s reputation as a cure for kidney disorders. Though it is a common mineral with a wide distribution, the bulk of nephrite jade mined today is from British Columbia in Canada, where it is found in the form of huge boulders, as heavy as 100 tonnes. Nephrite jade is a variety of the actinolite–tremolite series of minerals, which commonly forms as elongated, fibrous crystals in metamorphic rock. Actinolite and tremolite are two minerals that share the same chemical formula, and are made up of calcium, magnesium and iron silicate. The iron and magnesium substitute for each other, and when iron is more prevalent than magnesium, it is known as actinolite. When magnesium is the more prevalent, it is tremolite. It is worth noting that actinolite and tremolite are two of the six varieties of asbestos. But in nephrite jade’s case, immense pressure has caused the elongated crystals to become very tightly interlocked and compacted, until they are no longer individually discernable, and cannot break up into tiny fibres as asbestos does. The tight interlocking of the crystals in nephrite jade is also responsible for the mineral being very dense, and consequently very tough. So much so, that it is described as the toughest stone on earth. Typically, nephrite jade ranges in colour from green to gray, but opaque white and yellow are also possible. Green and yellow shades occur when iron is prevalent, whilst white and gray occur in the presence of magnesium. Nephrite jade’s toughness and resilience meant that it was the material of choice for Neolithic toolmakers, who crafted axe heads and other cutting and digging implements from it. The ancient Chinese called nephrite jade the “Stone of heaven”, and considered it the most precious thing on Earth. They began mining it some 6000 years ago and started importing it for the last 3000 years, using it for decorative and ceremonial purposes. They were particularly enamored with the white coloured material, which they valued more highly than gold. It was believed that nephrite jade could preserve the body after death, prompting at least one Chinese ruler to construct a suit of jade, with which he was entombed. 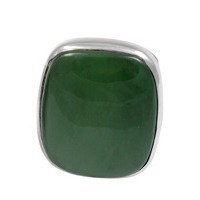 Generally, nephrite jade has been considered by the Chinese to be a stone for good luck, prosperity and longevity. Plates and cups were carved from it in the belief that the energy of longevity would be passed on to the food and ingested. 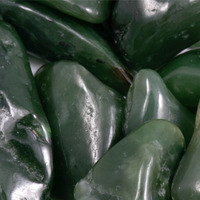 To the Maoris of New Zealand, nephrite jade, which they refer to as pounamu, has been an important cultural element since as early as the 12th century. Originally carved into tools and weapons, it is to this day used to create hei-tiki, distinctive pendants worn for their spiritual significance and protection, and handed down from generation to generation. In Europe nephrite jade first became prized as an ornamental stone only after trade routes with China were opened in the 16th century. From the Stone Age until then, it was only exploited for tool making. Nephrite jade is a stone of the heart chakra, which imbues a sense of balance, calm and serenity, and encourages self-realization. It assists in calming the mind by relieving it of negative thoughts, and similarly acts as a protective talisman by helping to remove harmful energies from one’s proximity. It’s soothing, heart-focused energy makes nephrite jade an appropriate aid for dealing with emotional trauma. The Chinese recognized Nephrite Jade as an agent of balance and harmony – of self, of positive and negative polarities, and of relationships. It is often given as an engagement gift between couples, or as a sign of friendship. 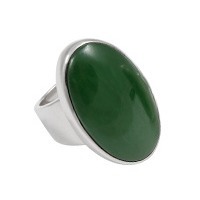 One can use nephrite jade to create harmony in love, family and business. As a tool for manifestation it teaches us money mastery and helps us to attract prosperity and abundance into our lives, in part by encouraging us to overcome greed and scarcity complexes. Nephrite jade helps us to be attuned to the world around us. It allows us to be comfortable with our physical selves, and helps us to relate with others in our environment. It is said that sleeping with nephrite jade helps us to recall and interpret dreams. Physically, nephrite jade helps to stimulate white blood cells to fight infection. It also soothes the nerves and helps the body deal with stress and anxiety. Additionally, it lends the strength to recover from illness. It has long been held that nephrite jade cures kidney ailments. 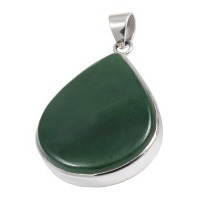 Nephrite jade relates to the astrological sign of Libra and vibrates to the number 5.